TBG has a wide range of experience in addressing issue related to the development of Boards and Senior Leadership Teams who are looking to improve their handling of change and transition, and further develop their ability to perform at a higher level, together with actively demonstrating the required leadership behaviours. We have also been involved in building and developing functional, cross-functional, service focussed, operational and virtual teams at all levels. Clients have included a wide range of managerial and clinical teams in the NHS, and in the private sector teams within BP, Takeda, Novo Nordisk, Eircom, BBC, William Grant & Sons Distillers Limited and ING. At TBG we are often asked to support team leaders in developing themselves and their people to become higher performers. There could be a whole number of reasons for requesting this support but one question we have found very useful to ask before going any further down the road of designing specific interventions is, are you actually a team or are you a group, or at times are you both? The primary reason for asking this question is to clarify what they mean by team because the word conveys different things to different people. Some people think entirely of sports, where coaching, ‘individual bests,’ and practicing hard to win matter most. Some think about teamwork values like sharing, co-operating, and helping one another. Some think that any group that works together is a team. Some believe any management group is a team. And some think primarily of two-person pairings like those found in marriage and partnership. In addition, we encounter many views on the benefits and costs of teams. Some people believe teams are a powerful vehicle for performance. Some believe their main value is to support and build self-confidence in their members, or to promote involvement, empowerment, and broad-based teamwork. Some believe teams add value only to short-term project work. On the other hand, many people believe team’s waste time, squander resources, and get in the way of decisive individual action and performance. Still others believe teams expose them to unpleasant personal risks like the loss of hierarchical control. 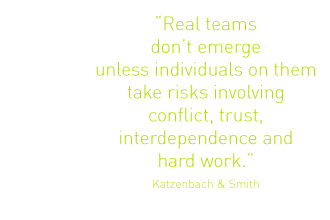 At the heart of their definition of team lies the fundamental premise, namely that teams and performance are inextricably connected. They believe that the truly committed team is the most productive performance unit management has at its disposal – provided there are specific results for which the team is collectively responsible, and provided the performance ethic of the organisation demands those results. By paying attention to this distinction we believe TBG has been more effective in designing team development activities which have contributed to greater levels of both individual and collective performance. This combined with our understanding of group dynamics and the appropriate use of psychometrics, 360 and Belbin Team Roles make our interventions highly effective. J Richard Hackman, Harvard Business School Press, 2008.